Panjim was raised to the status of a city, and officially became the new capital of Portuguese India under the name of Cidade de Nova Goa, on the 22nd of March 1843. The process of transformation of Nova Goa began long ago in 1759 when Cidade de Goa (Old Goa) became a hotbed of disease that spread its tentacles to the city’s suburbs. The epidemic prodded Viceroy Dom Manoel de Saldanha e Albuquerque to adopt the palace of Adil Shah as his residence and the pinnacle of political power in Portuguese ruled Goa. Later, Viceroy Dom Manoel de Portugal e Castro contributed monumentally to the reorganisation and reformative changes in Panjim, remaining undeterred by the prevalent political turmoil during his tenure. 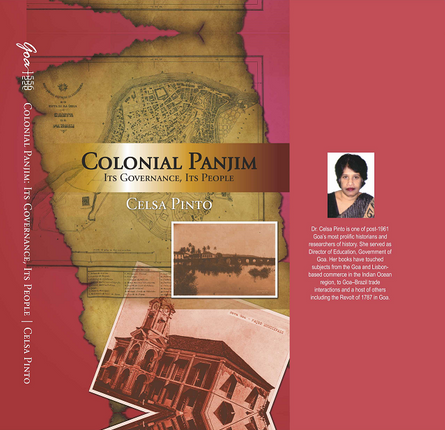 Dr Celsa Pinto, one of Goa’s prominent historians, documents the structural establishment of Nova Goa in her book Anatomy of a Colonial Capital: Panjim, followed by the related Colonial Panjim: Its Governance, Its People, which discusses aspects such as urban governance, jail administration, law and order, public health, etc in Panjim of old up to 1961. The author of A Revolt of the Natives of Goa, 1787 (2013), Goa: Images and Perceptions: Studies in Goan History (1996) and other books related to Goa’s trade history, Dr Pinto has served as the director of education for the Government of Goa and presented papers internationally as well. Her new contributions to the recording of history are welcome in light of the fact that the city of Panjim will be completing 175 years in March 2018. There are some interesting details in the books that come to our notice. What is today known as Campal was once called Campo de Dom Manoel, a promenade lined with trees built by the eponymous Viceroy Dom Manoel de Portugal. In 1859, there was house to house garbage collection in Nova Goa with the city being divided into four districts. Each district had an inspector, a cart and a cartman to cater to the removal of garbage. Human waste collection was started in 1896, which was gradually replaced with septic tanks, seeing that 186 houses in Panjim had septic tanks by 1950. Annual painting of houses and properties was made a rule by the Government. In 1840 municipal orders stated that external walls could be painted any colour other than white because its reflective quality could cause damage to the eyes. The 1830s saw in place regulations to impound stray animals and release them to their owners after a fine was paid. In the late 1800s rat catching was rewarded with payment to encourage the decline of diseases spread by rats. Stray dogs were put down to curb rabies and snake catchers were rewarded in the 1880s. It is evident that painstaking research has gone into the collection and cataloguing of elements and facts that converge to conjure up the image of an emerging Nova Goa and its metamorphosis over time. Despite the limited funds and labour force, the government at the time, as evident in the two books, managed to carry out essential utility works and its governance in Nova Goa with a certain degree of success. Although a product of scholastic research, the books are rendered appealing to the non-academic reader as well, owing to the jargon-free style of writing. In addition, the texts are provided with a glossary of Portuguese words, conversion of weights, currency and measures, and tables recording numerical data to aid in the appreciation of the information in the books. At the release of Anatomy of a Colonial Capital: Panjim and Colonial Panjim: Its Governance, Its People at the Institute Menezes Braganza, Panjim, Dr Celsa Pinto expressed her gratitude towards Dr Teotonio R de Souza, erstwhile director of the Xavier Centre for Historical Research, for his expertise and mentoring as her guide for her doctoral thesis. It was his persistent motivation that led Dr Pinto to overcome her dislike for the Portuguese language and the subject of economics to produce her PhD thesis. Trade and Finance in Portuguese India: A Study of the Portuguese Country Trade, 1770-1840 is a revised version of her thesis published in 1996 and her first extensive work in history. He once admonished her for not handing in a paper in time by saying, ‘You know in Russia they send athletes to the Olympic Games with this instruction that if you return without a medal you will be sent to the firing squad.’ Not one to hold back from praise when it was due, after Dr Pinto’s paper presentation on the Anglo-Portuguese Treaty of 1878, Dr De Souza sent her a note of appreciation which said ‘Extremely well done! Well planned and well executed paper. Keep it up!’ Dr Pinto preserved the piece of paper through the period of her doctoral research, looking at it as an incentive to carry on her work if she ever felt despondent. ‘This is what Dr Teotonio R de Souza was – he made me a historian!’ says Dr Pinto. 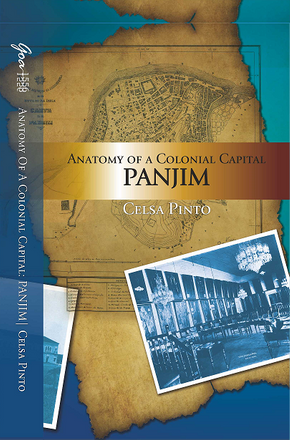 Anatomy of a Colonial Capital: Panjim and Colonial Panjim: Its Governance, Its People, will definitely not be the end of Dr Pinto research in the area of Goa’s history. More work of this nature is necessary and welcome to preserve the veracity of our valuable historical past.